Democrats have their eye on Pete Sessions' seat. Who will they pick to challenge him? Seven Democrats filed to run against U.S. Rep. Pete Sessions, a Dallas Republican. The race is now down to Colin Allred and Lillian Salerno – two former Obama administration officials who argue Sessions is vulnerable. The two Democrats running for one of the national party's top Texas targets for 2018 have a lot in common. Both grew up in Dallas. Both became attorneys. Both served as government appointees in the Obama administration. 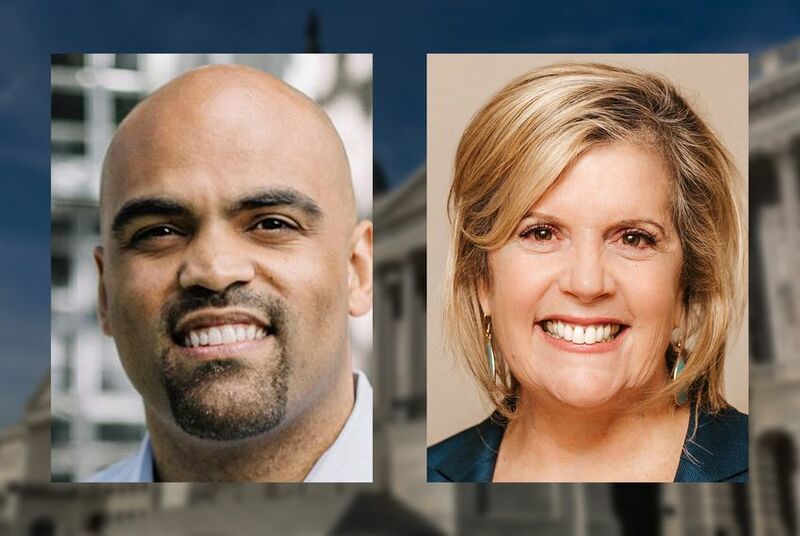 But along with leading in prominent endorsements and fundraising, Colin Allred got more than double the votes Lillian Salerno did in the March 6 primary. As early voting kicks off today in their runoff, Salerno's biggest challenge may be convincing potential voters that the party's nomination is still up for grabs. “We definitely have the momentum with this race," Salerno said last week, disputing any suggestion that Allred is the front-runner. However the chips fall on May 22, both candidates are preparing to take on Republican U.S. Rep. Pete Sessions for the Dallas-based 32nd Congressional District. "For a long time, this area has been ignored [by Democrats]," Allred said. "All North Texans should be happy that we’re going to have a competitive race in the fall." That there are Democrats even willing to run for this seat is an extraordinary development in local and national politics. Sessions ran unopposed last cycle, garnering 71 percent of the general election vote. He is a powerful committee chairman and ran the House GOP campaign arm in one of its most successful terms ever in 2010, a position that required political acumen and gave him connections to more donors nationally than most congressional Republicans. The cause for Democratic optimism in Dallas is that Sessions' U.S. House district is one of three in Texas represented by Republicans where Hillary Clinton won more votes than now-President Donald Trump in 2016 — the others being U.S. Rep. John Culberson’s 7th District in Houston and U.S. Rep. Will Hurd’s San Antonio-to-El Paso 23rd District. Ask any operative watching the Texas federal campaigns and most will say that of the three seats Democrats are challenging most directly in the fall, Sessions will be the hardest to dislodge. The first round of the Democratic primary for the 32nd District was a friendly affair with a packed field that included a number of prominent and well-funded Dallasites. Both Allred and Salerno drew enough support to continue to the runoff, but Allred’s vote tally was startlingly large: He carried 38 percent of the vote, with Salerno placing a distant second at 18 percent. While this new one-on-one fight is a bit more adversarial, there is little, if any, overt mudslinging. In recent forums and interviews, Allred in particular has generally stayed above the fray. Given his March 6 performance, Allred might not feel the need to engage with Salerno. He began the campaign last year with the support of several high-profile Texas Democrats, including former U.S. Secretary of Housing and Urban Development Julián Castro and former state Sen. Wendy Davis. Allred ran hard on his biography. The son of a single mother, he was a star football player at Hillcrest High School in North Dallas and went on to play at Baylor University and then in the NFL. After five seasons with the Tennessee Titans, he retired and went on to earn his law degree from the University of California at Berkeley. He then worked for Castro and Davis in official and campaign capacities. After the primary, the national party closed ranks around him. The Democratic Congressional Campaign Committee, the House Democratic campaign arm, soon named Allred to its “Red to Blue” program, an indicator to donors of which candidates to prioritize. Salerno released a furious news release at the committee's presumption, but it earned little traction. The support goes beyond the DCCC: Leading Democratic members of Congress are gradually lining up behind Allred with donations to his campaign. It's a striking shift from the fall, when Allred was among the weaker fundraisers in the field, showing a mere $62,000 raised in the third quarter. He has since righted his fundraising ship and now has the financial advantage over Salerno. In his latest campaign finance report, he raised $173,000 and reported $263,000 in cash on hand. Salerno has taken a tougher tone with Allred in recent weeks, but as in the first round of campaigning, her jabs largely lack a personal sting. Her central argument against Allred is that she is the more experienced potential public servant. Salerno also grew up in Dallas, then attended the University of Texas, the University of North Texas for graduate school, and then Southern Methodist University for law school. She started a small business that was integral to developing technology that would prevent HIV transmission through accidental needle stick injuries. She went on to work on then-Sen. Barack Obama's 2008 presidential campaign and would go on to serve in his administration. She argues that the Washington players lining up behind Allred are miscalculating – an argument that's taken on new weight this cycle, as the DCCC took heat from party activists in February after releasing opposition research against Laura Moser, one of the Democrats vying to unseat Culberson in Houston. Moser made the runoff anyway. Salerno trailed Allred in the most recent campaign finance report, but she held down her cash flow and entered the final stretch of the runoff with a healthy $160,000 in cash on hand. And she was not without her own prominent supporters: former Texas Agriculture Commissioner Jim Hightower campaigned for her last week, and U.S. Sen. Kirsten Gillibrand of New York endorsed her in February. She also has the support of EMILY’s List, a Democratic fundraising group that bolsters female Democratic candidates who support abortion rights, which is often a game-changer in Democratic primaries. But the group has spent little on Salerno. She said she was appreciative of their endorsement but did not expect major financial resources to come into her race. Whoever wins the runoff will face an incumbent with considerable financial resources. Sessions' latest campaign finance report showed he has $1.5 million in the bank as he readies for the fall campaign. And it’s not just Sessions’ money the Democratic nominee will need to worry about. Politico reported Friday that billionaire Sheldon Adelson cut a check to a GOP leadership-aligned super PAC called the Congressional Leadership Fund. Should this race become as competitive as Democrats hope, it’s likely some of that Adelson money will be spent in Dallas attacking either Allred or Salerno. The 32nd District is one of dozens around the country that swung hard in one direction or the other during the Clinton-Trump matchup, and some of the smartest political minds are skittish about whether that election was the beginning of a major political shift or merely the bizarre anomaly of an unusual election night. For now, there are no certainties that this race will be among the most heated next fall. Nathan Gonzales of Inside Politics, a noted House race handicapper, puts the race in the “likely Republican” category — a category on which many local and national political operatives from both parties privately agree. Early voting in the runoff continues through Friday. Election Day is May 22. Disclosure: Baylor University, the University of Texas at Austin, the University of North Texas and Southern Methodist University have been financial supporters of The Texas Tribune, a nonprofit, nonpartisan news organization that is funded in part by donations from members, foundations and corporate sponsors. Financial supporters play no role in the Tribune's journalism. Find a complete list of them here.